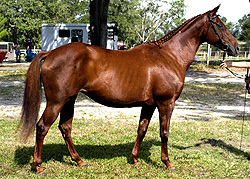 In foal to Blue Eyed Dream GTfor 09. 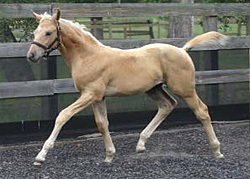 The 09 foal is guranteed palomino color. 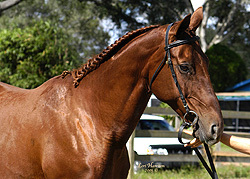 She is registered dutch warmblood (KWPN), and is also approved for breeding with RPSI and AWR. Hana's sire is the top jumping Dutch stallion Best Of Luck. Hanna is a perfect mother, both foals we've gotten from her she had with no problems at all. 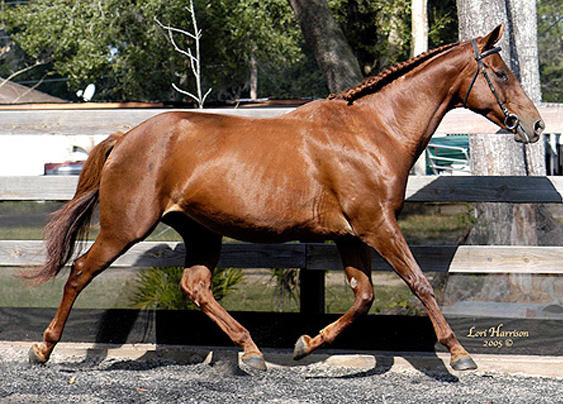 Her offspring are tall, with beautiful ground covering gaits and lovely conformation. 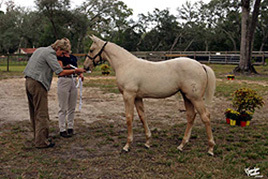 Her 06 filly by Blue Eyed Dream GT scored Gold Premium with RPSI and First Premium with AWR. 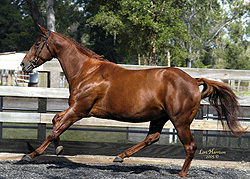 Recently her 07 colt by Blue Eyed Dream GT scored First Premium with AWR! Awarded First Premium with AWR & Gold Premium with RPSI.